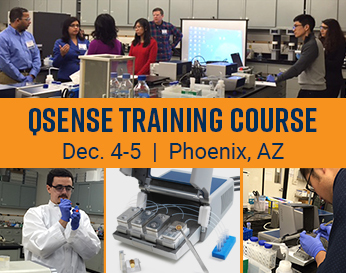 We invite you to join us for QSense Training on December 4-5, 2018 in Phoenix, Arizona. The aim of the course is to provide a basic level of understanding of QCM-D technology and related routine applications. You’ll get the hands-on experience you need to properly operate the Biolin Scientific QSense instrument and you’ll learn how to interpret the data for your application. QSense methods and protocols will be reviewed and used throughout the course. Participants are advised to bring their PC laptops for data analysis. The per-registrant course fee is $1,200 for those in academic or government labs and $1,900 for industry. For some customers, the fee is prepaid/included with their system purchase. To register, verify your payment status, or if you have any other questions, please contact Nanoscience Instruments at info@nanoscience.com or 480.758.5400. Registration is on first come first serve basis and is required so that we may prepare the training materials.